It has been a long time since I posted a battle report on the blog, so this next report was long due! As I did not have much time to play, we agreed on playing just 1,500 points. Try some new unit. 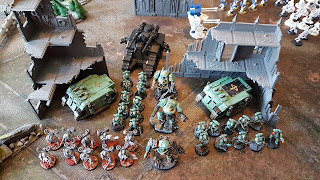 I have not used the Terminators in battle, but 1,500 points are not enough for them, so I decided to try the Reavers instead. The whole Army needed to fit into a single maxi Feldherr bag, as I could only carry one with me, this means using less miniatures than what I am used to. Thanks to the Rite of War of the Delegatus, both Veteran units count as Troops. The List is built around the idea of having few miniatures and testing the Reavers, so it does not have a very clever master plan behind. 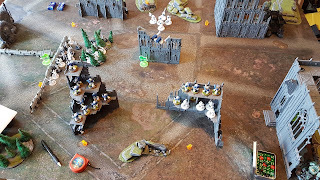 The basic strategy would be to hold on Reserve both Veterans and Reavers and hopefully outflank on the second turn taking advantage of The Edge of the Spear rule. The three Dreads and the Sicaran meanwhile try to deal some damage to the main force of the Enemy while the Dread with Chainfist tries to get as close as possible to the biggest damage dealer of the Army, which is most likely a Predator or a Deredeo, based on previous battles. We both rolled for our Warlord Traits and I got Bloody Handed (causes fear) and he got Paladin of Glory, (fearless), which somehow invalidated each other. We then rolled for mission and we got War of Lies and Ambush, in which one Army ambush the other, having the Defender deploy in the middle of the battlefield and the attacker entering the field for any of the opposing sides of it, and for the mission points we got five objective markers that we needed to capture in a fixed-size six turn battle. 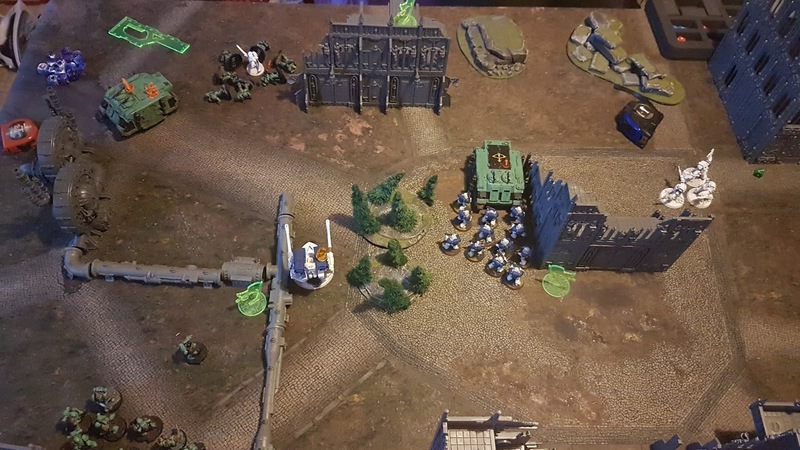 I won the roll for the deployment so I chose to be attacker as I felt that one of the best things of my Army was the ability to Outflank which three units and hopefully surprise the enemy. Therefore, the World Eaters proceed to deploy in the center, more or less covering every possible side. 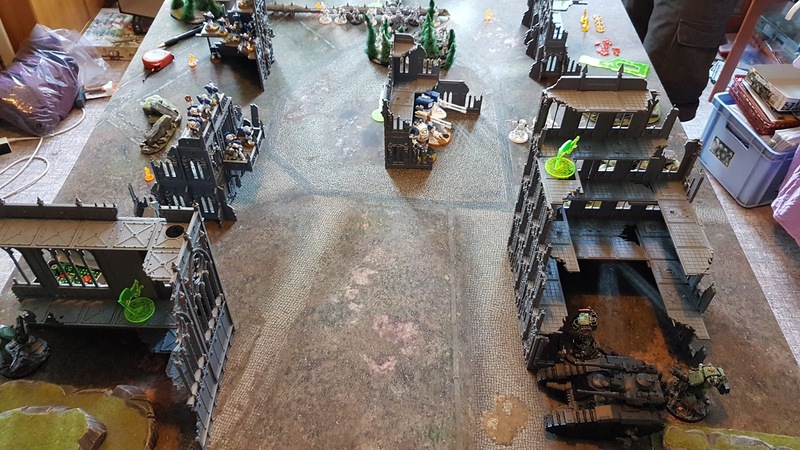 While I deployed my three Dreads and the Sicaran on the right, denying completely the left flank, with the idea of Outflanking on turn two onto one of the sides, and pushing through one of the units with two of mine. Since I would oppose two Dreads and a Sicaran vs the Deredeo and Dread, I thought I had good chances of doing something nasty. The World Eaters start the Battle by just moving slightly to the side of the building, to get some cover against the fire that will come from the Sicaran and Dreads. There was no shooting or assault on this first turn. The Sons of Horus start by moving the three Dreads and the Sicaran towards the enemy. The Dread with Multi-melta misses the shot against the Deredeo, and all the shots from the Sicaran against the Deredeo also have no impact. Then the Red Butchers get a shower of fire from a Dread with an Assault Cannon but they manage to save all armour rolls. So basically no effect on the first round of shooting! 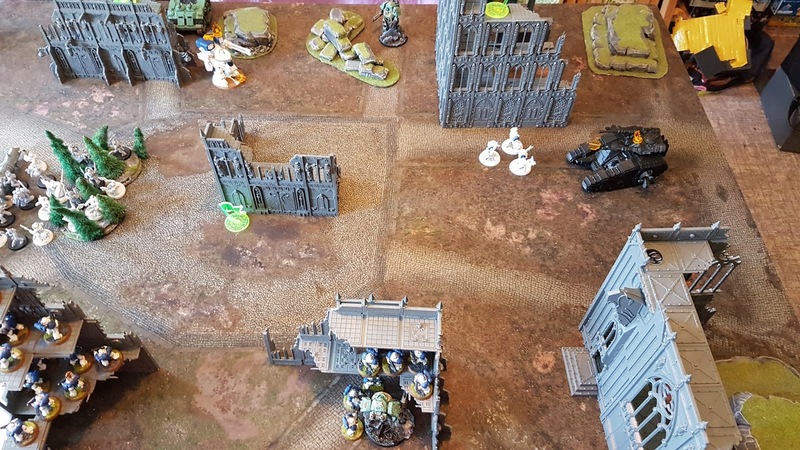 On the assault phase the Dread manages to assault a tactical unit and kills two marines, the sergeant has melta-bombs but he does not manage to kill the Dread. The unit passes the Morale test so we continue for another round. On the second round things start to get nasty for the Sons of Horus. The Deredeo shoots the Sicaran and manages to immobilize it. The Contemptor shoots the Cortus and it takes one hull damage point. In the assault phase, the Contemptor does not manage to reach the Cortus, but the Red Butchers assault the Cortus that has the Multi-melta and manage to kill it with ease, with the Cortus managing to kill one Butcher before dying. 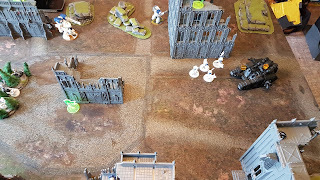 The combat between the unit and the Cortus at the bottom of the battlefield continues with another casualty for the World Eaters, which does not force them to run. This was the turn I expected some of my reserves to arrive with Outflank and to make a difference on one side of the table. 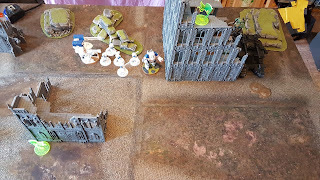 I managed to get both Veteran units on the table, on the same side, so I decided to roll in with the Rhinos and shoot both Plasma guns to the rear of the Deredeo, thinking that I might destroy it, and then I would be free to deal with the unit of the Praetor in the next turn. 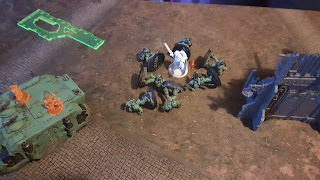 During my shooting phase the Sicaran managed to kill one Red Butcher after shooting all possible weapons at them and the Vets managed to just destroy one weapon of the Deredeo, after four shots with rapid fire. Not what I was expecting! 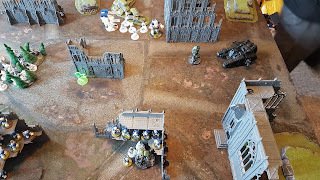 On the Assault phase, my Cortus that was overcharged with +1 I managed to kill the opposing Contemptor and started to advance towards the injured Deredeo. At the bottom of the field, the Cortus still does not manage to kill any marine, so the combat continues. 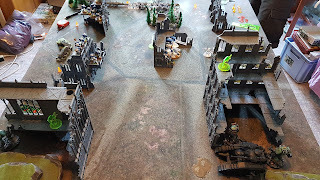 The World Eaters managed to destroy the Sicaran in the assault phase with the Red Butchers and injured my Cortus causing another hull point to be lost. 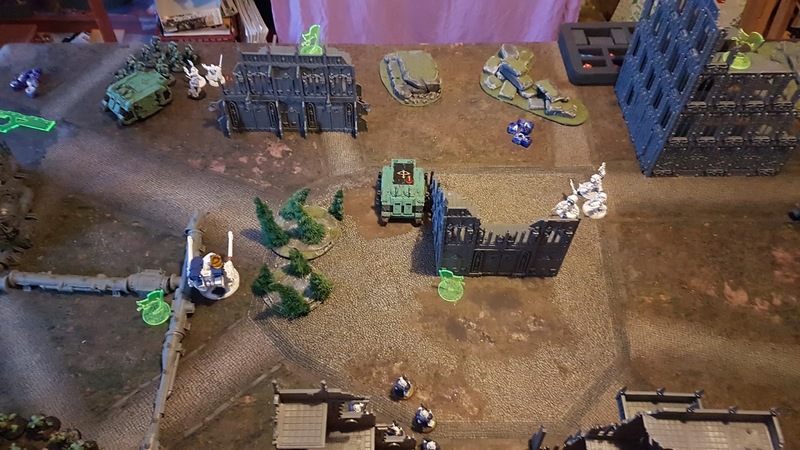 The combat at the bottom of the battlefield continues and now there are only six marines against the Dread. 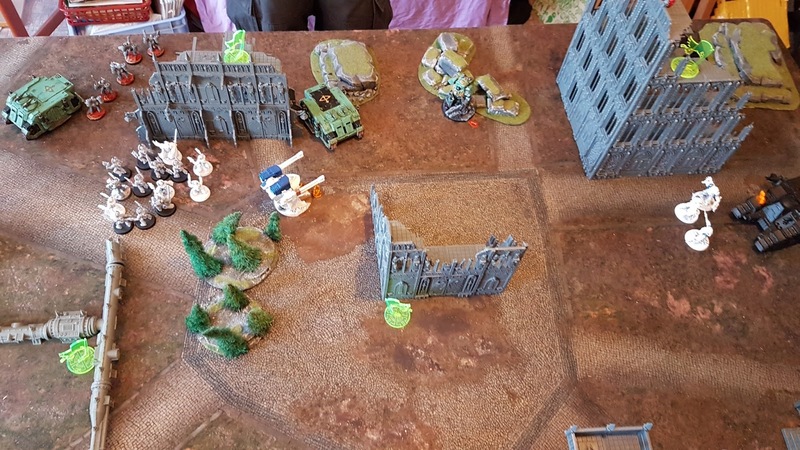 During my turn the Reavers appeared, again, from the same side of the table as the veterans. Having lost the Sicaran I focused on the left side of the table. One of the Veteran units disembarked and started to advance towards the World Eaters, while the other shot the Deredeo from the top of the hatch. 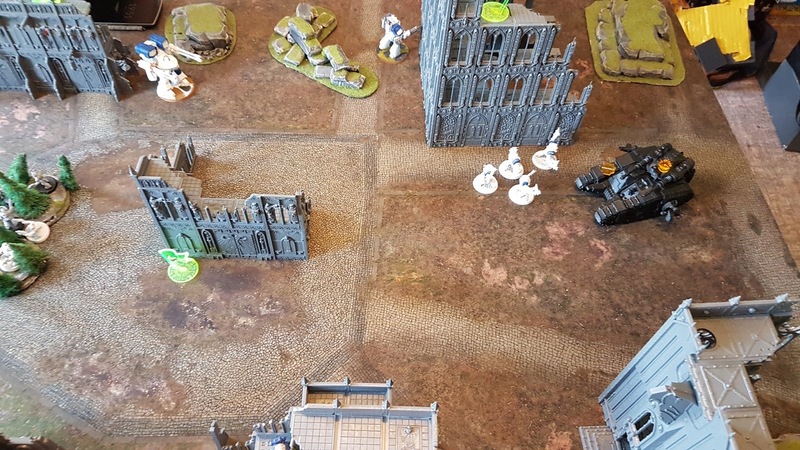 The Reavers with my Consul advanced towards the World Eaters. On the shooting phase I failed my shots against the Deredeo and I realized I should have probably disembarked and shoot the World Eaters so that I could assault them. That was probably a big mistake. After a very unsuccessful shooting phase, I assaulted with the Reavers and with the Veterans, but the Veterans failed the assault as they needed a 5 and rolled a 4. Big disaster as I was counting on having the bigger number in order to get extra attacks thanks to Merciless Fighters. To continue on the same trend, the Cortus, overcharged, tried to assault the Deredeo and it was killed before it had a chance to reach the assault. 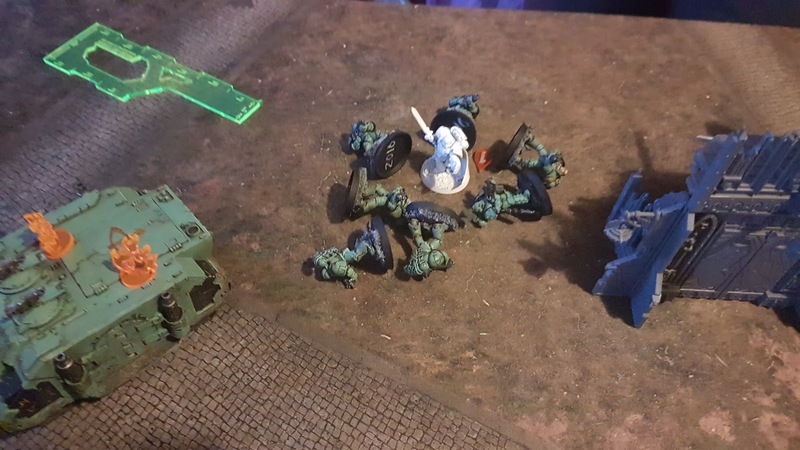 The battle was already going downhill for the Sons of Horus at this stage, so the World Eaters just needed to let it flow to win. 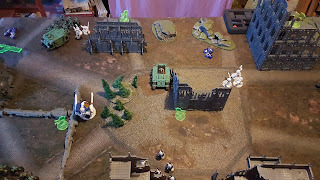 The Deredeo continued to walk backwards getting a bit further away from my Cortus while at the same time shooting at it, without destroying it, yet. On the Assault phase, the World Eaters charged against the remaining Reavers and destroyed them. Then consolidated waiting for my assault with the Veterans. 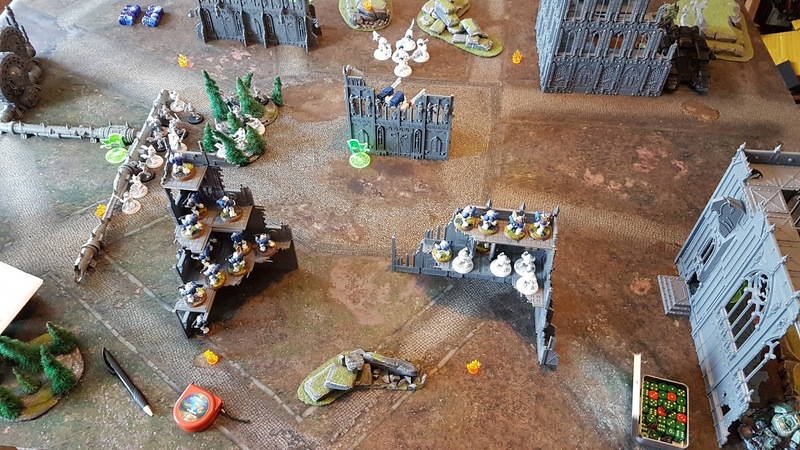 To make things worse, at the bottom of the battlefield, the combat between the Dread and the marines that was lasting since the first turn ended when they managed to kill the Dread. On my turn, I disembarked the Veterans and shot with both units against the unit with the Praetor, dealing little damage. 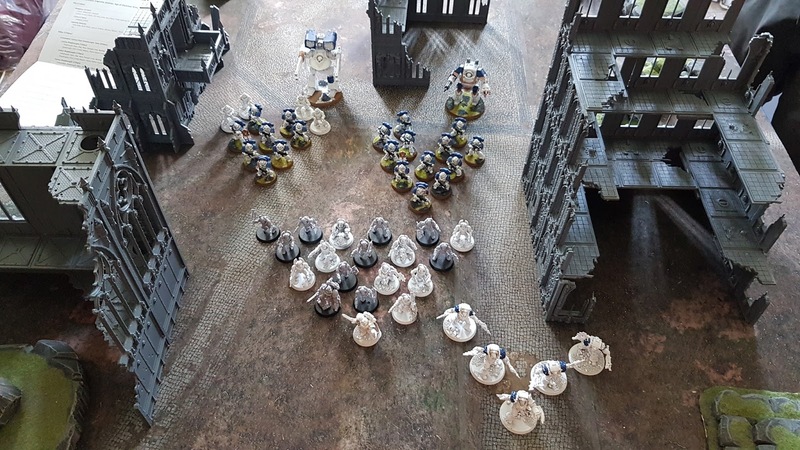 Then, on the assault phase, after a total of 54 attacks, 14 injuries were dealt and only 4 World Eaters died. Then the World Eaters attacked and killed 8 veterans, causing a major panic on both units that caused them to run away and be wiped out. Even though the battle was for six turns, there was no need to continue it, after this turn only one Rhino was left. At the end, even though the Praetor was the only miniature left of the unit, and with two injuries, he had managed to wipe out three entire units. In any case, I think the list could work well with some adjustments, probably I need to change the equipment of the Consul, as it was pretty much useless against more powerful opponents. On short, I need to play more to keep on learning from these mistakes.